Today I reveal some of the best RSS feeds for keeping us up to date on UK property and Mortgage news. There are hundreds of great widgets and apps and feeds on the web today and property news feeds are essential if you want to keep up with current changes in the UK housing market. So I thought it would be cool to reveal ours. A consumer site for everyone interested in homes and property. Dedicated to news for homeowners and people seeking to become homeowners. Zoopla is the new kid on the block and has had an incredible year. With recent TV advertising, its become obvious Zoopla intends to challenge Right Moves supremacy. Our 2nd helping from the Telegraph feed, this time detailed and insightful financial advice, including the latest information about mortgage rates and taking out a mortgage. Channel 4 is the UK largest television station for Home releated programmes and this feed is a great way to keep alert to the current programmes related to home improvement, grand designs or property ladder and of course Location location. 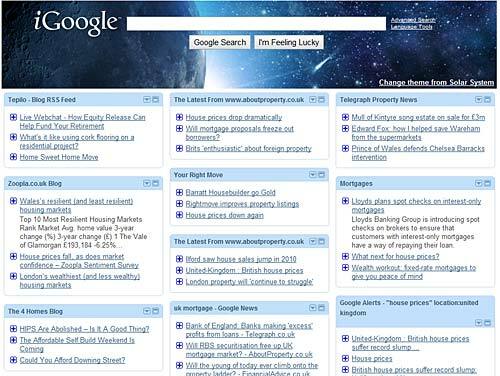 Google newshas various sections including a UK mortgage news area. This is a Google Alert for the keywords “House prices”. I would suggest you also set an alert for your specific interests. It’s a great rescource for finding new sites. Property feeds are essential for keeping an eye on the property market, hopefully we have introduced you to a few new ones to keep an eye on.